Howdy all. I wanted to do a quick post on restricted budgets, because you really truly don’t need mega bucks to pull off cool spaces. We all know that style has got nothing to do with money – often times a smaller budget actually forces you to be more creative, and the results are the most stylish. Question is can you decorate your pad for next to nothing? Here are a few ideas that you can do super quickly, are highly impactful and won’t break the bank! If your sofa or chairs have seen better days then layer them with throws. I do it with sheepskins, a whole heap of them which I just throw over chairs. It adds such a beautiful texture and makes you want to sink straight into it. 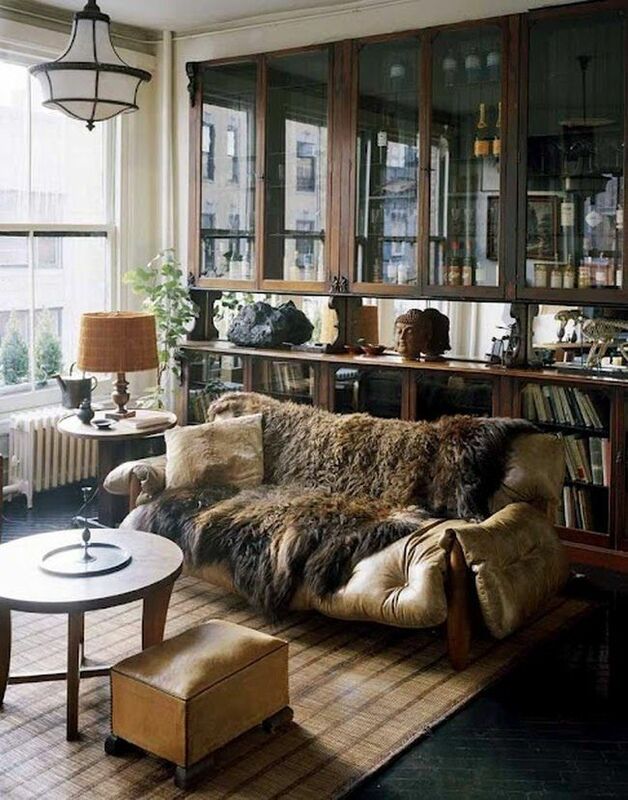 Of course you don’t have to use sheepskins any old throw will do. Check out a genius trick from one of our recent house crushes – Kate has used rugs to make the coolest, squishiest looking sofa. Fairy lights and string lights are not just for Christmas. They're the cheapest way of lighting a space and creating a magical glow (rather than a harsh nasty overhead light). I string mine over mantles, cupboards and mirrors. They are beautiful at night and at any time of the year! Use spray paint to transform door handles and pieces of furniture. Be creative is what I want to say - let's say you can’t afford that 7K glossy console hanging out in some uptown gallery – a situation I found myself in 6 or so years ago. No big deal! Work out how to achieve something similar without spending a fortune. I went to an antiques market, picked up an ornate console for £50 and took it to a car sprayer. They sprayed it in a bold glossy red for a little under that and wham bam I had this beautiful piece for £100. You can go even cheaper of course and just pick up the paintbrush yourself. When I was writing Girl's Guide to Decorating I experimented with tons of DIY projects and how-to's, and to be honest I didn't understand why I hadn't done it earlier. As long as you're prepared to put in the work with a spot of sanding and priming, you can transform any furniture for next to nothing. This is a trick I've used time and time again on floating shelves - pick up a cheap IKEA jobby and painted it to match my walls. It instantly looks bespoke. If you want a high-end looking extraordinary finish, you don’t actually need to buy the real McCoy. Just hunt out the coolest wallpaper that emulates some truly expensive finishes like metallic tile, concrete or herringbone wood, and then paper odd bits and pieces of furniture with it - genius. My trick when decorating for less is to not make it feel as so. I may want you to think that something is a marble table (it's actually been wallpapered with a marble paper) or that expensive looking lacquered table has been picked up from a cool downtown gallery when in fact its been car sprayed. It's all about creating an illusion, making spaces feel grander and cooler than they really are. Smoke and mirrors as they say - magicians' illusions! Constantly think outside of the box. Can’t afford a 20K kitchen buy a cheap carcass and bespoke your own doors (B&Q for no cost provide a free cutting service). They cut the wood for ours (I elongated them to make the kitchen feel more bespoke) and for next to nothing I got a cool looking kitchen for not a lot of money. Don’t let money stop you is my point – in fact my point is let nothing stop you. I believe if you think outside the box you can have the most magical pad on earth without it costing you a fortune.